Posted February 18, 2015 by Tony Jones & filed under Books. 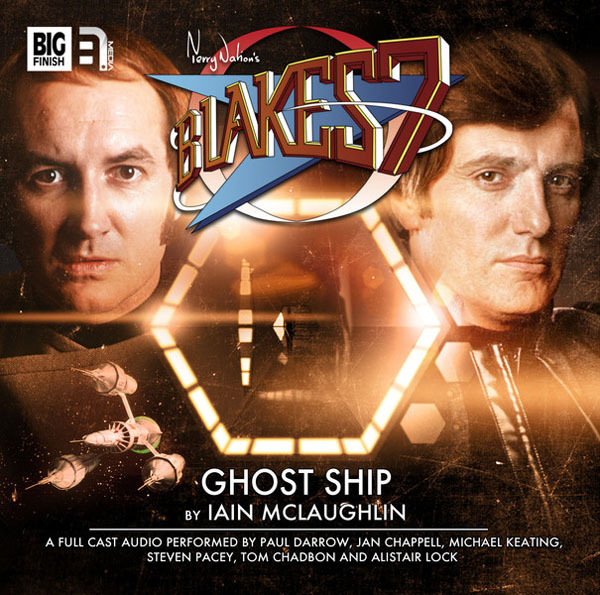 The full cast, single-disc audio Ghost Ship is the latest Blake’s 7 story Big Finish has released in their second series of classic adventures, this latest written by Iain McLaughlin. There is an overall theme of the search for Dayna (this is set during Blake’s 7 Season C), but that is all but incidental to this story. The plot hook is simple – if you are approaching a planet with a reputation for being inhabited by ghosts, surely the safest place to be is in orbit in the Liberator while the rest of the crew go down to the surface. This is why Vila (Michael Keating) is on teleport control duty with only Orac and Zen for company (both voiced by Alistair Lock). Of course it isn’t that simple; there is another presence on the ship. Vila has to deal with strange spectres who know his name, and are determined to test his sanity. Unusually for a full cast story, Keating gets the lion’s share of the airtime and has plenty of interaction with Orac and Zen. This gives Lock a chance to exercise his skills as he contrasts the vocal styles of Orac (tetchy and superior) with Zen (logical but often equally unhelpful). Of course no good Vila story works without verbal sparring between the cowardly thief and Avon (Paul Darrow) and there is plenty here to enjoy. Although a ghost story, the audio cues are played deftly building the tension through the story and never dominating. Lisa Bowerman’s direction is flawless as ever and everything comes together to make a story that fits perfectly into the Blake’s 7 setting. Even if you aren’t a regular listener to this range, Ghost Ship is very accessible and worth buying in its own right. Extras: Eight minutes of behind the scenes interviews with the cast and production team. Released on 8 February 2015 by Big Finish Productions Ltd.